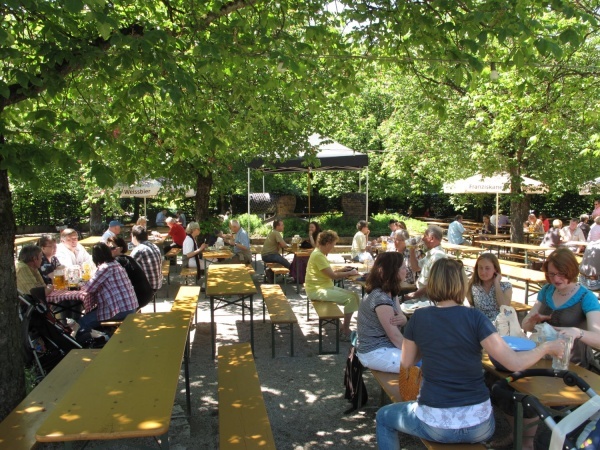 The Hopfengarten beer garden is located on the east side of Westpark in central Munich, next to the Adi Dome, the former Rudi-Sedlmayer-Halle sports arena. The beer garden was opened at the time of the first German Federal Garden Show held in Westpark in 1983. Hopfengarten is a favourite meeting place amongst regular visitors and families of the recreational areas around the lake in the park. The 1,500 seats are partly shaded by still young chestnut trees and large sun umbrellas. There is no serviced area. Steckerlfisch (grilled fish on a stick) is prepared daily amongst other Bavarian specialties, such as Hendl (roasted chicken), Rollbraten (rolled roast), Schweinshaxn (roasted pork knuckle), Wurstsalat (sliced sausage salad) and Obatzda. A Maß Löwenbräu Hell (lager) costs €7.30 (May 2015). On warm summer days various Munich bands perform live in Hopfengarten (Thursday and Sunday). Major football tournaments are shown live on a big screen in the beer garden. Each Saturday a flea market takes place in Hopfengarten. Against a fee of €10 tables and sun umbrellas are supplied free of charge to anyone wishing to sell their various items. The beer garden is open daily during the summer from 11am until about 11.30pm.